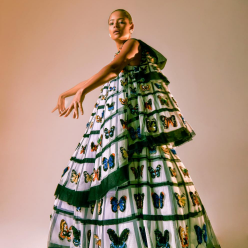 SCAD FASH Museum of Fashion + Film presents "KALEIDOSCOPE KATRANTZOU: Mary Katrantzou, 10 Years in Fashion," an exhibition celebrating the 10th anniversary of the coveted designer's eponymous label. Katrantzou is acclaimed for her bold colors, textures and prints, which she expertly wields into kaleidoscopic, sculptural creations. This retrospective of the designer's work, which will be on view April 9 - September 22, features iconic looks that reveal her innovative approach combining fashion, art and technology. For more information, visit www.scadfash.org.